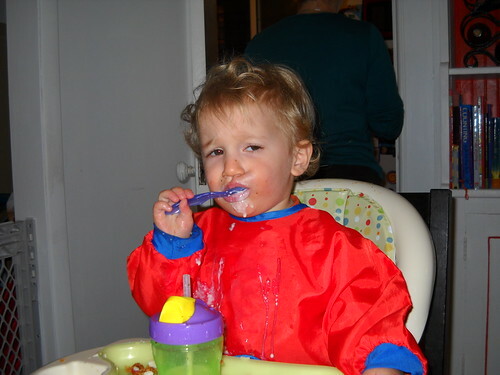 Curly enjoys his first Oreo* cookie. *In this evening’s performance, the role of “Oreo” will be played by Newman-O’s organic creme filled chocolate cookie. There is a poll embedded in this post. Now that Curly is approaching 2, it seems that things are clicking for him at a greater speed than before. He’s not yet at the point where he’s picking up 10 new words a day or anything like that, but he does pick up one or two or a sign here and there. His favorite new sign and word is “helicopter” (pronounced “Ca-ta” for copter, and signed like this). He is forever looking for things he knows and saying them. The other night, Nutella and I gave him some crayons which he wasn’t very interested in, but when she and I drew things he knows (like a banana, a dog or flower), he would happily point them out and say or sign them. 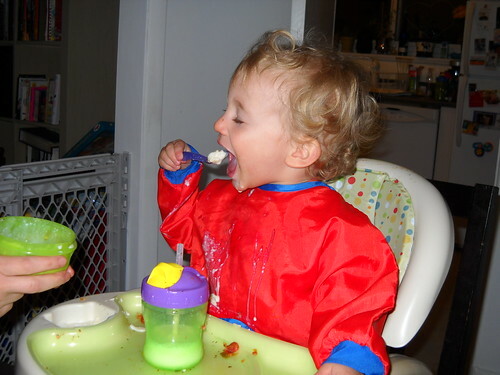 He’s much more willing and able to use a spoon and fork, although it’s a huge mess of course (see evidence below). He has begun answering yes or no questions, even if he doesn’t always mean it. We’ve definitely come to the point where the answer to most things is ‘no’ and then he tries to do or eat whatever he just turned down. He has (and I hate to jinx it), very short-lived tantrums. Like 10 seconds of screaming, or simply throwing himself on the floor and sucking his thumb. I’d like to think this is in part because we address things immediately. He knows that screaming will get him either put on a step (which works pretty well these days), or put in his crib, so he usually gives up quickly. He loves books more than anything else and is constantly searching for his favorites. I think we need some new ones! Unfortunately, he probably won’t start potty-training until he’s 3, but you can’t win everything. Still, we feel that he’s on the cusp of a learning explosion and it’s a really exciting thing to watch. We continue to be total softies for Valentine’s Day. 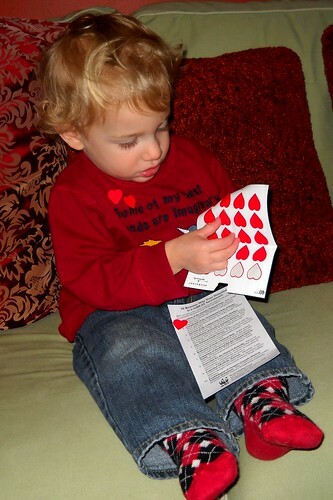 We dressed Curly in his red shirt and red socks and sent him to daycare with a small pile of valentines for his friends (each containing sparkly stickers). And then Nutella and I played hooky, visited some friends and met their itty bitty 3-week old baby, and had a fancy schmancy lunch. It was 65(!) degrees out so we walked off lunch and then relaxed until it was time to pick up the munchkin and all the valentines he got from everyone else. Happy Valentine’s day, blogland! I thought I’d update on how our search for good babysitters has gone. We joined C@re.com a few months back, for one month. We posted a job description, noted how easy it would be since he would be sleeping, and said the person must be comfortable with our two-mom family. Oh, and like chihuahuas. We got a ton of responses. It was fairly easy to tell the good ones from the bad. We interviewed 4 people. The first sitter we used 3 times. She was nice and mostly responsible, but talked our ears off, was late on a time-sensitive night, and we felt was encroaching a bit on employer/employee boundaries. We’re looking for a babysitter, not a new friend, sorry. She’s still on our list, but we haven’t used her in a while. The second sitter seemed perfect…was really nice and friendly at the interview, sounded mature and responsible. And then disappeared. She didn’t respond to our emails asking her to babysit. We were sad, but what can you do? Guess something didn’t work out for her and we took the clue and moved on. The third sitter was on the younger side (21), but had lots of experience. We’ve used her 3 times so far and each time has been perfectly fine. Of course, she recently asked if she could bring her 17 year-old sister along with her sometimes to keep her company. Seems strange to us, no? I mean, the sitter is in school so she can do her classwork or watch tv or movies, or surf the web like she’s been doing. Maybe her younger sister is just so bored at home that she wants to accompany her? Anyway, it’s definitely not a deal-breaker, but it’s weird. Finally, we just interviewed a fourth sitter this past weekend. She’s perfect. In grad school, mature, responsible, tons of experience, lives 5 minutes away, and studying to be a speech-pathologist. We haven’t used her yet, but are thinking about making her our primary sitter. The only thing is she graduates this year so who knows what will happen afterwards. Anyway, C@re.com is obviously working out great and I highly recommend it. Besides, where else can you find jewels like the following responses? Despite that I am a college student, I have always been very responsible, dependable and great with kids. So are you planning on walking? I AM A TWENTY-FOUR YEAR OLD WIFE, LOOKING TO GET INVOLVED IN THE GROWING OF NEW FAMILIES. I own two dogs, two ferrets, a snake, and fish, so allergies are not a concern to me. Thank you for listing your menagerie. I didn’t know one could be allergic to fish. I respect that you are a two mom family, the majority of my friends are either bisexual or have gay parents! Where were these kids when I was growing up?? I have extra time that can be used with kids because i really enjoy them. Not much wrong with this except that it was the entire response. Nothing else. I know this phase will pass quickly, but at this point, Strawberry and I are both addressed as “mama” by Curly. So when one of us leaves his presence he loudly and repeatedly calls “Mama! Mama? Mama!” At home, this is sweet. Out in public it just makes it appear that whoever is with him ISN’T his mother.